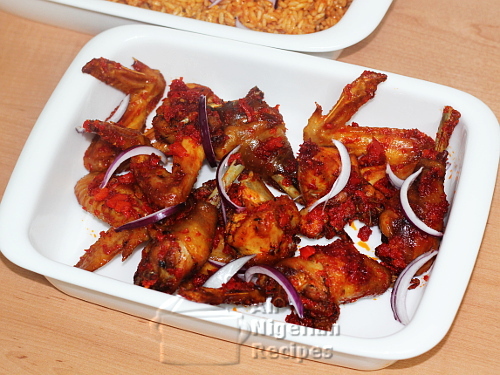 Peppered Chicken is a great addition to your Nigerian party food. It comes to the rescue when you have one or two friends visiting. It's surely a great snack to catch up on the latest gist or watch a football match over, with some chilled drinks to wash it down. 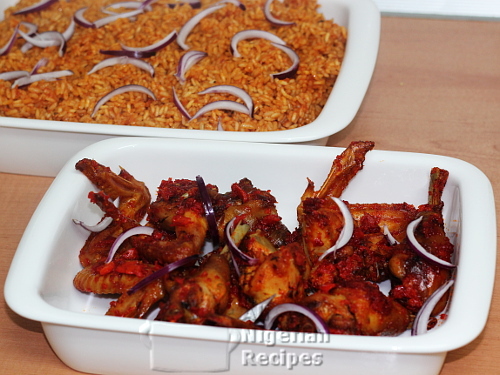 Serve your Jollof Rice with Peppered Chicken and watch your family lighten up over the dinner table. Peppered Chicken is indeed the popping red, spicy answer to the basic Grilled Chicken. Use hard chicken (hen) because the taste is richer than that of the soft chicken (cockerel or rooster). Tatashe peppers are Nigerian spicy red pointy peppers. Outside Nigeria, use Tribelli peppers (Pimentos Tribelli in Spanish). The peppers produce a popping red juice when blended making it a great alternative to our Nigerian Tatashe. The only difference is that Tribelli peppers are not spicy. Tribelli peppers are sold under different brand names in different countries. The Scotch bonnet peppers (alternative habanero peppers) is atarodo, ose oyibo or atarugu. Its job is to add more bite to the tatashe. If you do not like spicy hot food, you can use only tatashe. I use a combination of Tribelli peppers and scotch bonnet because Tribelli peppers are not hot and if you want to use only scotch bonnet peppers for this, the peppered chicken will be too spicy and you will not enjoy it even if you love spicy food. The thyme should have fine particles. I add the thyme from a shaker that has tiny holes so that only the tiniest particles pass through. One of the onions is for cooking the chicken while the other is for garnish. Use red onions for garnish. Cut one of the onions into tiny pieces and cut the other into thin slices. Remove the seeds from the tatashe or Tribelli peppers, cut them (as well as the scotch bonnet peppers) into small pieces and blend with a hand blender. The blending should be coarse not smooth (see video). Any blender that allows you to grind the pepper without adding water should do. For a normal blender, add just enough water to help the blades of your blender move. Clean the chicken. Cut them into desireable sizes if you bought whole chicken. Place in a bowl and add the thyme, diced onions and stock cubes (crushed). Massage the seasoning and spices into the chicken with your hands, cover and put in the fridge to marinate for at least 1 hour. When the chicken has marinated for 1 hour, place in a pot, pour some water and start cooking. I add water because I use a pressure cooker. If using a normal pot, just start cooking and by the time it starts to boil, water will seep out from the chicken. When the chicken is done, take them out and grill/broil in the oven at 180°C (350F) till golden all over. If you are preparing another meal on the same day (say Nigerian Jollof Rice), use the chicken stock (water from cooking the chicken), to prepare it. If you are just preparing Peppered Chicken to serve with a chilled drink, put the chicken stock in your freezer, chicken stock always comes in handy when you are preparing another meal. Pour the vegetable oil in a dry pot and heat it up. Add the pepper blend and start frying on low to medium heat till all the water dries up. Add the grilled/broiled peppered chicken and stir very well with a spatula till the popping red peppers have coated every inch of the chicken. Add salt at any time if necessary. Serve with any Nigerian Rice dish and/or Salads. You can also serve it as a snack with a chilled drink. Peppered Chicken is a great addition to your party food. If you have any questions about preparing Peppered Chicken, click here to ask me.